The airmen who monitored the Soviet threat during the 40 years of the Cold War in Avro Shackleton aircraft have been remembered with the unveiling of a memorial. Some 140 Avro Shackleton crew lost their lives between 1951 and 1991 as the stalwart bomber took part in maritime reconnaissance, anti-submarine missions and search and rescue roles. At the height of its operation, 100 Avro Shackletons were stationed with 12 squadrons, and up to 40,000 air and ground crew served on the aircraft. 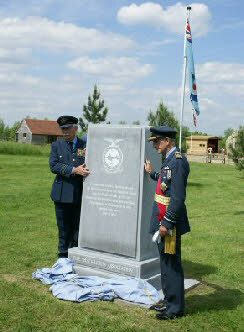 Wg Cdr Bryn Lewis, the Chairman of the Shackleton Association, joined 120 former crew at the National Memorial Arboretum, Staffs, yesterday for the unveiling of a granite obelisk by Air Chief Marshal Sir David Parry-Evans, the President of the association (full article). The Armed Forces Memorial at the National Arboretum includes, within its sixteen thousand names, the names of those comrades of the members of the Shackleton Association who were lost during the course of Shackleton aircraft operations. This Register has been compiled in the order in which their names are engraved on the Memorial. As we all know well, crews of Shackleton aircraft spent many, many hours flying low over water during their sorties, so I cannot think of a more appropriate place for their Memorial than this beautiful site by the river. The grey colour of the granite reminds us of “the Old Grey Lady” and all who flew in her. A handsome aircraft outside, a little bit rugged inside – and quite interesting to land in a strong crosswind. With this Memorial, we remember with pride all those who flew Shackletons and we must also, of course, remember all those who serviced them. We had difficult times when the grey lady mis-behaved, but mainly, many happy times when there was laughter, and comradeship, and the satisfaction of a job well done. This Memorial, too, is a job well done. I commend most warmly those who conceived the idea and carried it through to fruition. Nor do I forget those who so generously contributed to its cost. It will be here for generations – and it is a comforting thought that in time we will all be remembered in this idyllic place.